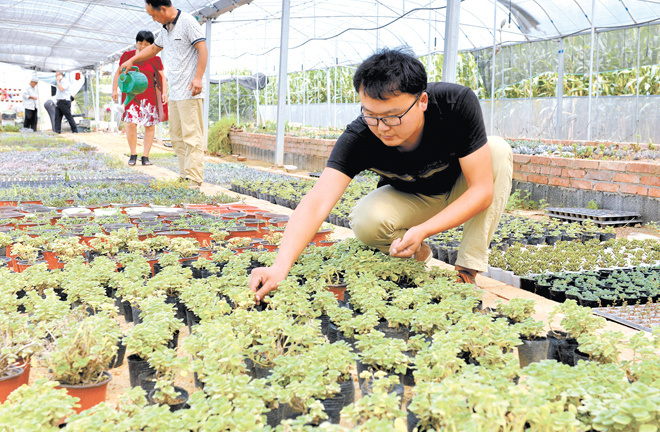 College graduate Xu Changli cares for his succulent plants in a greenhouse. He is one of the millions who have returned home and launched startups after living for years in cities. In recent years, urban-rural integration has accelerated and national policies are encouraging progress in rural areas. Many migrant workers, college graduates, technicians and retired soldiers are choosing to return to their hometowns to start businesses by drawing on years of accumulated knowledge, capital and technology from their time in the cities. This group of people is called “urban returnees” in academia. The number of urban returnees is estimated to be as high as 5.8 million, including 4.5 million migrant workers and 1.3 million from other sources. At present, the rural governance in China is undergoing several transitions—from closed to open, from urban-rural separation to integration, from uncertain collective property rights to defined property rights, and from control management to service governance—whereas there are also increasing numbers of hollow villages, super villages, new types of rural communities, and villages in the city. These new features and problems pose challenges to the modernization of China’s rural governance system and capabilities while urgently requiring innovation of traditional rural governance theory. In this sense, urban returnees could inject vitality into the vast Chinese countryside and represent an important force to promote the modernization of rural governance. Compared with those who stay in villages, urban returnees have multiple advantages. To start with, they have obtained the knowledge and skills to survive in modern society, so they have better vision and can think out of the box. They are also well connected and have better social networks that enable them to have a wider circle of friends and get in touch with people from different walks of life. They know how to communicate and build ties with government, enterprises, and social organizations. In addition, they also tend to experience more ups and downs in life, which has made them more resilient. After years of hard work in cities, they have more resources of funds to construct, operate and manage businesses back home. For this reason, the group is regarded as an important part of the new “countryside elites” by some scholars. In the past, villages were governed by respected individuals, but modern rural governance involves government agencies, social organizations, clans, elites and villagers. The homecoming of urban returnees accelerates the modern transformation of the rural governance structure. Urban returnees are expected to inject into village governance urban notions like teamwork, shared economies, consultative democracy, openness and entrepreneurship, breaking down outmoded models of minority decision-making, backdoor dealings and apathy toward public affairs. The local government and committees should broaden the platforms that enable urban returnees to participate in village governance and promote local prosperity. First, urban returnees could be brought on board in various social organizations, such as the elderly associations as well as the youth and women’s societies. In the post-agricultural tax era, the relationship between the state and farmers has radically changed. In the past, the state collected resources in a unified manner from the rural areas and farmers, either according to household or individually. However, in today’s world, the government aids villages and farmers by offering special agricultural subsidies, cultivating new agricultural management bodies, raising farmers’ income and increasing the availability of basic public services in rural areas. In most cases, the government provides resources in the form of projects, so urban returnees can take advantage of their expertise in project governance. As the new countryside elites, urban returnees can ensure resources are correctly allocated to households or personnel and that villagers receive the dividends of national policy. Real experience shows that urban returnees have unique perspectives on promoting the development of rural enterprises, rural cooperatives, family farms and rural culture. With the training of modern industries, this group is adept at integrating the limited human, material and financial resources to ensure the implementation of projects. Urban returnees also have a role to play in promoting harmonious rural development. For one, they could become mediators of rural and national governance. In practice, rural governance could be divided into two categories: autonomous and national. The former is far removed from national policies and remains in a closed state, which is in some degree conducive to maintaining the traditional village order. However, it can easily malfunction. In the latter category, rural governance is integrated into the national framework, creating a benign governance model built upon the interaction between the national and local governments that takes into account each village’s peculiarities. Rural governance is the foundation of national governance, so it is safe to say that without the modernization of rural governance, there cannot be comprehensive modernization of national governance. At the same time, national governance guides rural governance, so if rural governance strays from the example set by national governance, it will head nowhere. In this sense, urban returnees could contribute to the interpretation of national policies concerning agriculture, countryside and farmers—known as “the three rural issues”—to ensure that rural governance stays in sync with the national plan. First, urban returnees could help establish some training schools to teach villagers about the national policies. With ample knowledge of local areas, they could combine national policy with the rural reality to put forward plausible plans that farmers are more likely to accept. Second, urban returnees could introduce new media tools to promote national policies on agriculture. They could use graphics and videos to explain projects or form online discussion groups on increasingly popular platforms like WeChat and QQ to answer questions. Last, a policy study group could be set up to teach villagers ways to help themselves and create and instill in them a love of learning. At the same time, it is key to not underestimate the role of urban returnees in creating a harmonious rural society. As the new type of urbanization accelerates, a growing number of villages are turning into modern communities. Thus, properly handling disputes about land requisition and housing relocation has become a thorny issue. Urban returnees are mostly village elites who enjoy prestige and social status in the countryside. The government should include them to promote village level consultative democracy. When formulating the compensation scheme for villagers’ land, housing and properties, urban returnees should be consulted as well to facilitate dialogue between local government and villagers in order to make plans that better fit the interests of all relevant parties. Because urbanization is an important indicator of modernization, local urbanization is crucial in the modernization of rural governance. As large numbers of rural people flow to cities in search of work, the number of sparsely populated villages grows in the underdeveloped areas, threatening rural governance. The population structure of these hollow villages is severely unbalanced. They mainly consist of left-behind elderly, children and women. This demographic structure has concentrated poverty, worsened security conditions and undermined the sense of safety. Urban returnees then provide an opportunity to solve these problems in hollow village governance. On the one hand, the government should support urban returnees to start businesses in the hollow villages, so that they can stay and more importantly bring others back home to form a reasonable population structure. On the other hand, by telling the stories of urban returnees who have successfully lifted hollow villages out of poverty, the government can help to promote a good image for villages. Urban returnees also play an important role in promoting the public participation of villagers, which is also a vital part of the modernization of rural governance. In this respect, urban returnees could play a leading role and bring scattered individual farmers together to seek common development. They could also help hold village cultural festivals to get villagers involved. Hou Zhiyang is from the School of Political Science and Public Administration at Huaqiao University.